In the heart of Nubia, about 300 km southwest from Aswan by road we find the impressive rock temples of Abu Simbel. They are situated on the west bank of Lake Nasser only 40 km north from the Sudanese border. 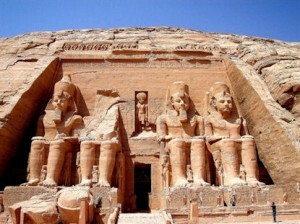 You can visit Abu Simbel by road (car or minibus) or you take an air plane. There are daily flights from Aswan to Abu Simbel. It is also possible to travel by cruise ship from Aswan through Lake Nasser to Abu Simbel. The twin temples of Abu Simbel where originally carved out of the mountainside between 1290 – 1224 BCE, during the reign of Pharaoh Ramses 2 in the 19th Dynasty as a lasting monument to himself and his queen Nefertari. This to commemorate his alleged victory at the Battle of Kadesh and to scare potential enemies approaching the southern region, as they travelled down the Nile from Africa. Abu Simbel was one of six rock temples erected in Nubia during the reign of Ramses 2. The Abu Simbel temples were formerly located further down the hillside, facing the Nile in the same relative positions. After the building of the Aswan Dam however, the complex of temples was threatened by submersion, due to the rising waters of Lake Nasser growing behind the Aswan Dam. Abu Simbel was saved from the rising waters in a massive archaeological rescue plan sponsored by UNESCO. In the 1960’s the two temples were dismantled and raised over 60 m up the sandstone cliff, where they had been built more than 3000 years before. Each temple was carefully carved into over a thousand pieces. Some of the blocks weighed as much as 30 tons a piece. They were removed and moved uphill. The pieces were then reassembled, in the exact same relationship to each other and the sun on an artificial hill. From the outside the fake mountain looks like solid rock. Inside the temples it is still possible to see where the blocks were cut. Inside the man made dome is an exhibition of photographs showing the different stages of the massive removal project. The most spectacular aspect of the Great Temple of Ramses 2 is its setting in the solid rock above the banks of the Nile River. The temple faces east and is dedicated to the gods Ra-Horakthy, Amun and Ptah, as well as the deified Ramses himself. The falcon headed sun god Ra-Horakthy is shown inside the niche directly above the entrance, who is greeted by carved baboons on top of the wall. The alignment of the temple is such that twice a year, in February 22 and October22, the sun’s rays reach into the innermost sanctuary to illuminate the sculpture on the back wall, except for the statue of Ptah, the god connected with the underworld, who always remained in the dark. Today there are big celebrations at the temple on these two days. The temple has four seated colossal statues, which appear to show Ramses in different stages of his life, each about 20 m in height. They are carved out of the living rock and fastened to the cliff wall. At the feet of Ramses, in smaller scale, stand the statues of his mother Tuva, his Chief Wife Nefertari and some of his many children. Inside, the temple is conventional in its design, with the floor level rising noticeably towards the sanctuary at the rear. In the first great hall is the ceiling supported by eight Osiris pillars in two rows. On the left, the colossal statues depict Ramses wearing the white crown of Upper Egypt. On the right the pharaoh wears the double crown of Lower and Upper Egypt. The walls are showing us colourful scenes of the pharaoh’s victories on the battle field, among them the battle of Kadesh (1275 BCE), Ramses greatest victory. The goddess Nekhbet on the ‘vulture ceiling’ leads us inwards, towards the vestibule. The vestibule is a smaller hall with four simple square pillars, showing Ramses and Nefertari offering to the gods, and other religions scenes. There are various magazines and store rooms leading off to each side which would one have housed the temple’s cultic objects and treasures. Beyond the vestibule we come to the sanctuary, the most sacred place, which houses four little seated statues of the gods Ra-Horakthy, Amun, Ptah and the deified Ramses 2, all carved from the rock of the back wall. North of the Great Temple of Ramses 2 is a little temple dedicated to the goddess Hathor, the goddess of love and beauty, and also to Ramses’ favourite wife Nefertari. The façade is adorned by six statues of the same height, four of Ramses 2 and two of Nefertari, which indicates the esteem in which Nefertari was held. The inside of this temple shows Nefertari participating in the divine ritual in the same capacity as her husband. The holy of holies, in the farthest depths of the temple features a statue of the goddess Hathor represented as a cow. Each night at 7:00 pm and 8:00 pm in winter time and at 8:00 pm and 9:00 pm in summer time there is a sound and light show. For visitors there are headphones to hear the commentary in various languages.